Gluten-Free and Vegan, this fresh, easy dish is packed with veggies and topped with the yummiest peanut sauce! Fresh, Flavorful -- sweet, savory, spicy, peanut-y -- so satisfying! This Sweet Potato Pad Thai Bowl is real win! Packed with goodness and fresh tasting, but it has multi levels of flavor and is so satisfying. Plus, it’s super easy to whip up! It’s simply sautéed sweet potato noodles, shredded cabbage mixed with shredded red cabbage, some red pepper and a savory dressing, crispy roasted tofu and the yummiest peanut sauce. Between the vegetables, tofu, dressing and peanut sauce, this dish is bursting with flavor! It’s overall savory, a little sweet, a little spicy (if you amp up the peanut sauce) and of course peanut-y. Plus there is a great mix of textures and just a little crunch to make this dish so satisfying. More on the Peanut Sauce… it is seriously so yummy, practically drinkable. 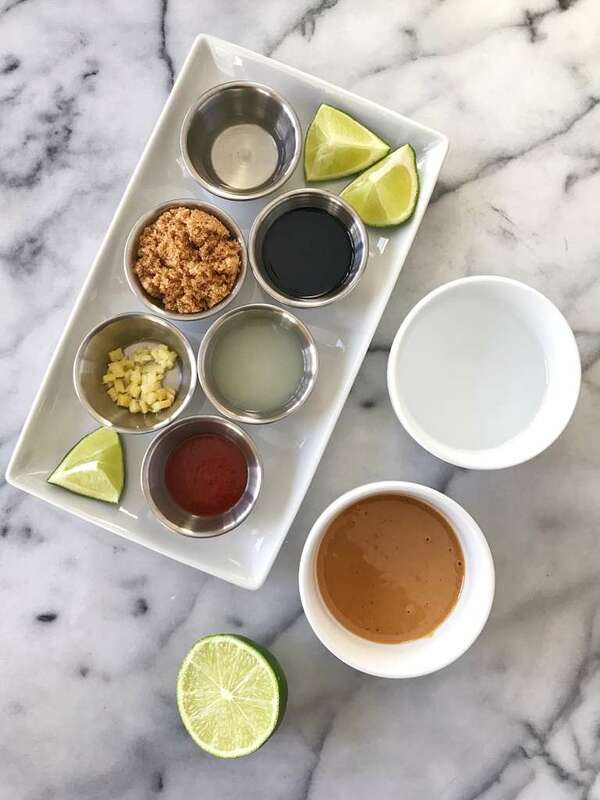 Made with natural peanut butter, gluten-free tamari, ginger, rice wine vinegar, lime juice, water, brown sugar and 2 “squirts” sriracha sauce, it is the perfect sweet – savory balance, with just a little or a lot of spice depending on your tastes and mood. 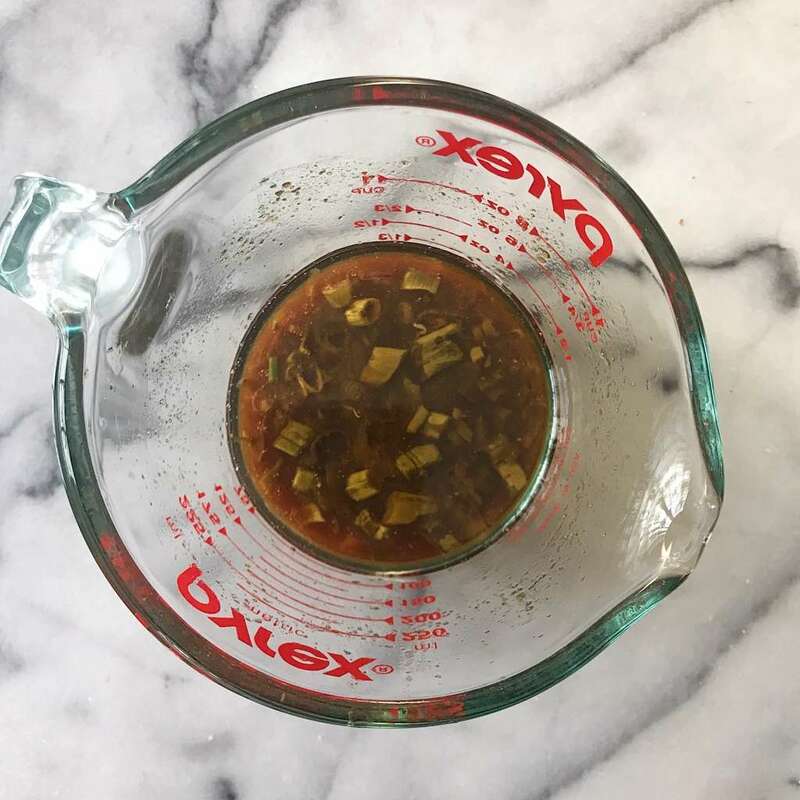 And a bit more on the dressing: The dressing is made with 8 ingredients which are heated stovetop for a few minutes for an amazing savory flavor. In this dish, we use half the dressing to marinate the tofu and half to dress the cabbage and even the noodles if you like. As for the tofu… even if you don’t think you love tofu, roasting tofu may change your mind! This tofu is marinated in the pad thai dressing then roasted at a high temp so that they edges are super crispy and it is so delicious! Marinating the tofu gives is so much flavor! The roasted marinated tofu dipped in the peanut sauce is simply divine. To be honest, the real reason I made this bowl was so that I could eat all the roasted tofu slathered in peanut sauce! While I haven’t done it, you could always substitute chicken for the tofu, marinate it in the dressing and saute it in a pan. Let me know if anyone tries it this way! 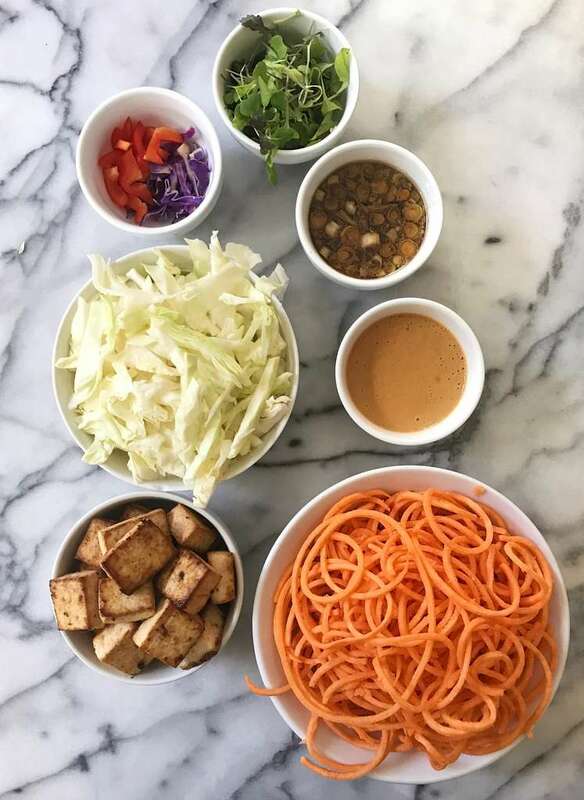 The tofu and peanut sauce paired with sauteed sweet potato noodles (we usually purchase them pre-spiralized) and a simple shredded cabbage slaw, is so delish! And the entire dish comes togethe quickly. Start with the dressing, use half of it to marinate the tofu. While the tofu marinates, make the peanut sauce and prep the cabbage slaw. Then while the tofu roasts, saute the sweet potato noodles. Assemble the bowl and enjoy! Bonus: Depending on how many people are eating this, you may have extra peanut sauce and tofu for the next day’s lunch! Mix it up with a kale slaw (mix of kale, shredded cabbage and shredded carrots) and enjoy! Hope you love this bowl as much as I do! Gluten-Free and Vegan, this fresh, easy dish is packed with vegetables and topped with the yummiest sweet-savory peanut sauce. It is packed with flavor and is so satisfying. Made for 2 servings. You could easily adjust quantity and add more or less of your favorite veggies and add any other protein. TIP: Start with the dressing. Then make the the cabbage slaw and peanut sauce while the tofu marinates, and saute the sweet potatoes while the tofu roasts -- the entire meal will ready to serve in just about 30 minutes. Remove from heat and add ginger, lime juice and maple syrup. Mix well. 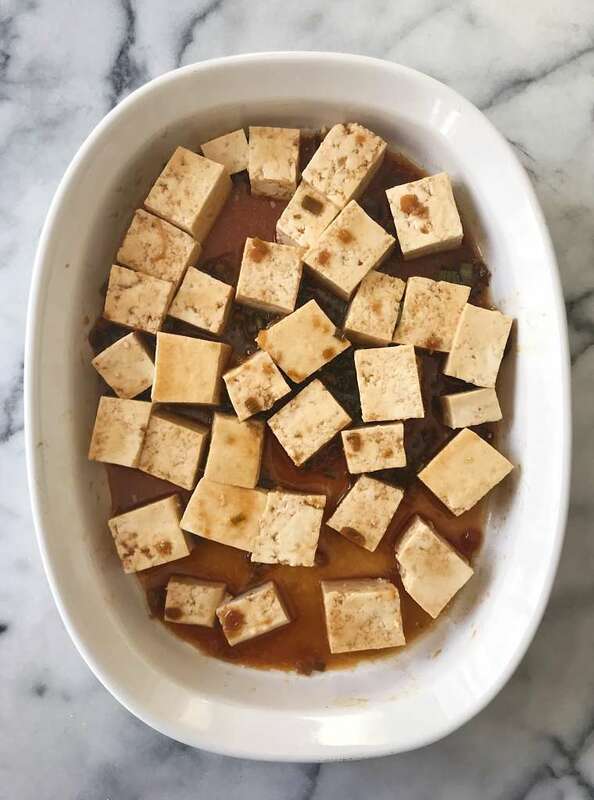 Place the cubed tofu and half the dressing in a large bowl or pan and toss to coat cubes in marinade. Let sit 15 minutes. Place tofu in single layer on prepared baking sheet. Top with marinade from the bowl. Roast tofu 10 minutes. Flip, and roast 5 minutes more, or until sides are golden brown. ( Tofu cubes will puff up a bit). Set aside. In a medium bowl, combine shredded cabbage, pepper and red or purple cabbage. Toss with remaining dressing to taste. Set aside. In a medium skillet, heat sesame oil over medium heat. (You don't want too much oil or the noodles get soggy). When the oil is hot, place sweet potatoes in the pan and sauté for 5 -10 minutes (depending on size of noodles - thinner ones, 5 minutes, thicker ones 10 minutes), stirring periodically so they don't stick to pan. Just before taking out, sprinkle with salt and pepper if desired (I don't find I need it with all the other flavors in the bowl) and add in sesame seeds and stir to combine. 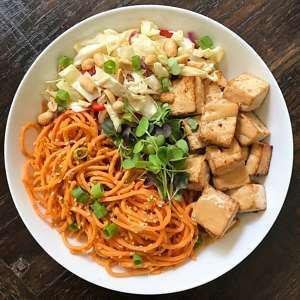 In each bowl, add sauteed sweet potato noodles, shredded cabbage mix and roasted tofu. Serve with peanut sauce on the side or drizzle on tofu. Add extra dressing to sweet potato noodles if desired. Garnish with peanuts and green parts of scallions. Serve and enjoy!